July is one of the hottest months of the summer and sometimes the sun is just too much. Therefore, come enjoy the Aquatic Center in Lake Havasu and cool off with the indoor waterpark and pool! Take a break from the lake and being outdoors to step inside a splish-splash family fun zone. Reasonably priced and lots to do for a full day of indoor recreation. What does the Aquatic Center offer? Clearly, there is plenty to do here! In addition to all of the choices, the large temperature regulated facility, and safety factor, there are also special events that are great for the whole family. Some examples of special events include dive-in movies and costume parties. You can even have your next birthday party here. If you get hungry, there are snacks however, it is okay to bring your own food, drinks, and snacks in, as well. Other amenities offered to the community include exercise classes. From water yoga, pilates, kickboxing, and tai chi, there is a full schedule of aquatic fitness classes. You can come and just do laps in the pool for exercise or even take swimming lessons. 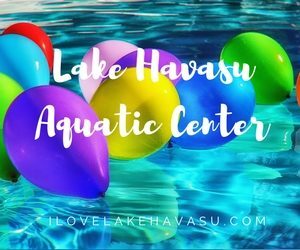 The Lake Havasu Aquatic Center is a great resource in our community and there is certainly something here for everyone! This Lake Havasu Aquatic Center information is brought to you by: Lori Dee Doerfler, For All Your Lake Havasu Real Estate Needs! « Family Fun in Lake Havasu!